2016 has arrived, and it’s the season of New Year’s resolutions. The turn of the calendar is the perfect time to switch up your routine and lighten your outlook on life. Whether you’ve resolved to save money, enjoy the moment, or run the distance, this year’s improvements shouldn’t end with you. Celebrate your fresh take on the world in your home, too! Some of the best low-budget room makeovers don’t cost a dime! Rearranging existing furniture within a space can work wonders for refreshing perspective and improving balance. Grab a pencil and paper and take a good long look at your space. Sketch out a quick diagram, and start shifting! Move that living room sofa. Give that dining room table a 90-degree twist. The possibilities are endless and nothing’s permanent, so feel free to rearrange until it feels just right. Add some color to your world. We’ve said this before, and we’ll say it plenty more times: color is powerful. It draws attention, reflects light, and sets the tone for the space. If you’re a lover of all things neutral or white, a vibrant living room accent wall could be magical. Or, if you’re already knee-deep in hues, change up the color temperature or create a fun pattern. In some cases, changing the entire perspective of a room is as simple as a single, well-placed accent piece. A contemporary occasional table or stylish chaise lounge, if situated just right, can draw attention, shift the color profile, or redirect focus to create a completely different space. Be creative—good things come in all shapes and sizes. If you’re really feeling restless, go big. Replace the things that feel ineffective with a little more room to breathe or pieces that do the job well. Lucky for you, the living room and dining room sets at The Room Place make redesigning an entire room as easy as pie. 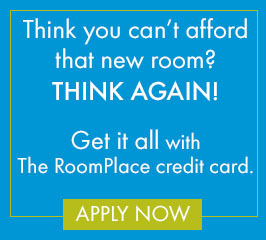 If you’re ready, stick to those resolutions, find a location near you, pay our showroom a visit, and Get It All at The Room Place! 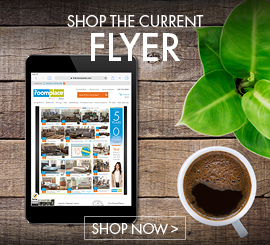 Visit our stores or shop online at www.theroomplace.com.